Chandigarh, 21st July 2008: Proliferating its distribution network in the emerging source market of Punjab, with an objective to enhance tourist arrivals to the destination, Tourism Malaysia today unveiled its Best of Malaysia- Mega Sale travel package. Tailored made to offer short breaks to Malaysia, this package will bring within the traveller’s ambit affordable holiday options at Kuala Lumpur and Penang. This package coincides with the ongoing Mega Sale Carnival in Malaysia themed as ‘Eat, Shop & Rejuvenate’. These packages are designed to enable the cash rich travellers from Punjab to splurge the maximum and make most of the Mega Sale carnival offering innumerable discounts ranging from 10% to 70% on an array of branded items. Virtually entire Malaysia is on sale bringing more than 220 shopping establishments in Kuala Lumpur at shoppers end with gross floor area from 80,000 to 3 million sq feet providing innumerable bargains and discounts to shoppers. More than 100,000 ‘Malaysia Mega Sale Carnival Tourist Privilege Card’ are to be distributed at hotels, shopping malls and the KL International Airport to make travel to Malaysia an attractive choice. The attractions offered in these packages include the cities of Kuala Lumpur or Penang offering a choice of long and short breaks. Common to both the packages are accommodation in star category hotel with breakfast, return airfare inclusive of taxes on Singapore Airlines, airport transfers on SIC basis and half-day city sightseeing. The 3 nights/ 4 days package @ INR 28,999 offers a chance to visit exotic Penang. While the 5 nights/ 6 days package @INR 33,499 offers both the destinations of Penang and Kuala Lumpur. Speaking on the occasion, Mr. Amirul Ariffin, Director, Tourism Malaysia, said, "Punjab today has emerged as a prominent source market contributing a share of approx. over 15% to the arrivals from North India region. It is our continuous endeavour to offer more innovative holiday options to the travellers from this region. Hence we are keen to further position our products like Mega Sale, Weddings in Malaysia, Fly & Drive, Soft adventure through Eco-Package, Malaysia My Second Home". After making inroads into primary cities of India, Tourism Malaysia is now focusing on the secondary cities seeking to tap the growing leisure and business traffic from Punjab, Tourism Malaysia will also hold an interactive trade session with the leading travel agents and tour operators in the cities of Chandigarh and Ludhiana. This product update session will highlight and showcase the destination product diversity as an international tourist getaway. 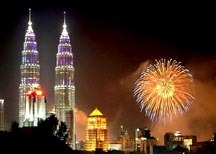 For the year 2008, Tourism Malaysia aims to target 500,000 arrivals from India market. The destination focus would be on the product featuring short-breaks beyond Kuala Lumpur to position the new gateways of Langkawi, Penang, Johor, Pahang, Sabah, Sarawak, Terengganu and Pangkor Island. India continues to remain an important tourism source market for destination Malaysia. For the year 2008, period between January-June 292,850 number of Indian travellers visited Malaysia, registering an increase of 26.6% as compared to last year arrivals for the same period. Please Em me full details including Hotels in KL and Penang on your Best of Malaysia Mega Sale Packages. Please let me know how I, living in Sri Lanka, could join these packages. 43, De Fondeka Place, Colombo 5, Sri Lanka.